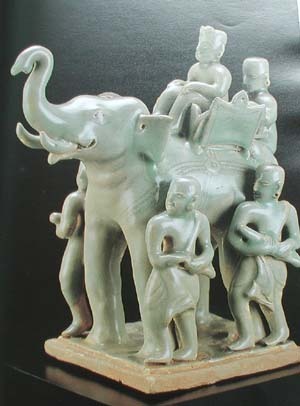 In September 1984 thousands of ceramic wares appeared in the antique shops of Bangkok, Sukothai and Chiang Mai. There were beautiful large Chinese and Sawankaloke celadons, Ming blue and white bowls, spectacular under-glaze black decorated dishes from Sukothai and Sawankaloke, wares from Kalong and Sankampaeng, superb late Haripunchai water bottles and an extraordinary and quite unknown group of white wares, some with vivid in-glaze green decoration which are now known to have been made in Burma. The wildest stories circulated.This was booty being taken back to Burma after the sack of Ayuthya in 1569 or was it 1767? They must have been dead soldiers since swords and daggers were often found in the graves, soldiers presumably fighting with plates, bowls and their very own burial urn in their knapsacks. Or were the goods from a series of markets along the old trade route to Martaban, the great port of Burma? Perhaps they were burial sites, but if so whose, high up in the mountains? 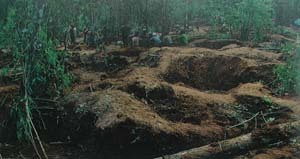 The only fact clearly established was that all these artifacts were indeed coming from the Mae Sot area of Tak Province near the Burmese border. 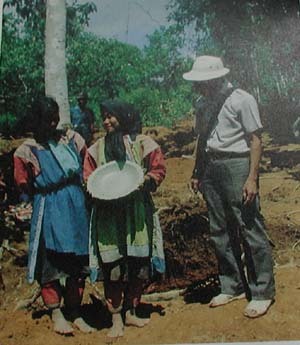 Then in February 1985 another deluge of ceramics surged into the antique market, this time from the Mae Tun - Om Goi area further north in Chiang Mai Province. Here there were many more wares from Lanna,from Sankampaeng, Kalong, Phan and Phayao. 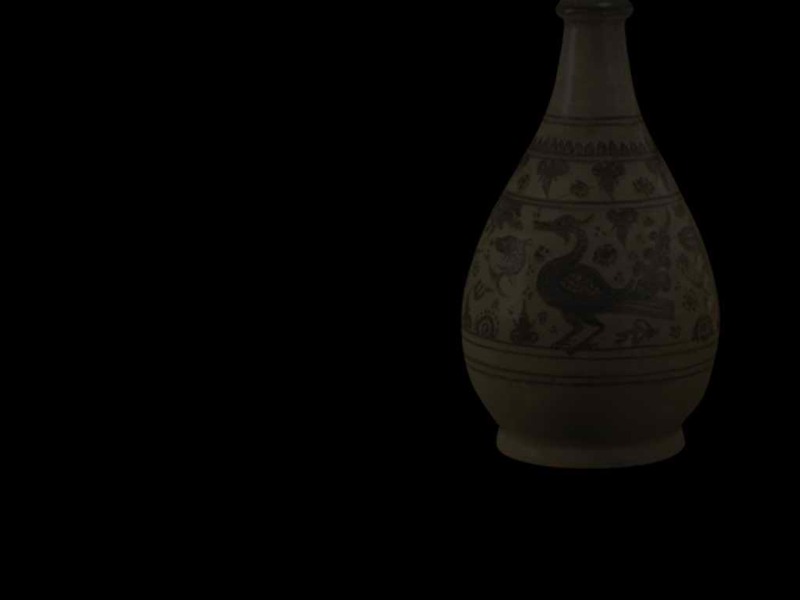 It is now definate that these ceramics came from hilltop burial sites. 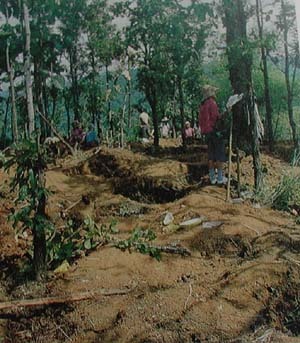 Thousands of graves from at least forty sites have been looted - they are scattered throughout the mountain spine of Thailand from Om Goi in the north, down through Mae Ramat and Ban Tak, Tak and Mae Sot, to Kampaengpetch and Umpang to the south. 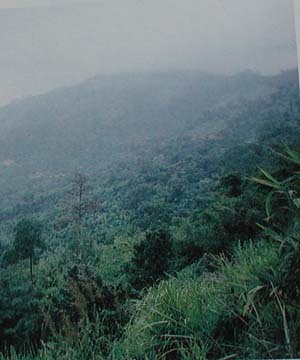 In almost all cases the sites are too far away from the main lowland valleys where it is thought that the wet-rice cultivating Thais lived, for it to be conceivable that it was they who carried the ashes of their dead unto the mountains for burial. Nor are the sites, with one or two exceptions, near any likely trade routes to the coast. 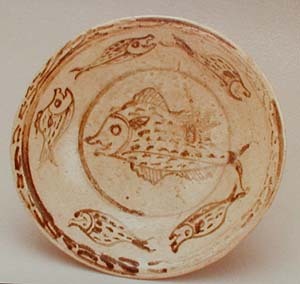 The probability that these finds are in any way connected with internatio0nal trade is remote in any case since the wares are so totally different from the selection of ceramics found in Indonesia, the Middle East and India, which would seem to be the most likely markets for goods shipped from ports on the Burmese coast. The wares of Sukothai must have passed through Ayuthya, which controlled the export trade, before sailing along the coast - where many junks were wrecked - on their way to the islands of Indonesia and the Philippines, the two major markets. 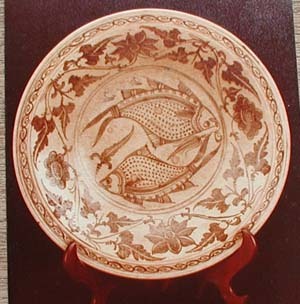 Ceramics made in Lanna are not known to have been exported. From the wares found the burials appear to date from the middle of the fourteenth century to the middle of the sixteenth century, the very period of the Golden Age of Lanna and Sukothai when the production of ceramics flourished. Who were these people who cremated their dead, placed the ashes in urns and then interred them in the mountains, accompanied with valuable objects? Were they perhaps the Lawa, the original inhabitants of the region - as it were the Celts of Europe - now living in the mountainous no-man's land between the powerful Burmese and Thai kingdoms? 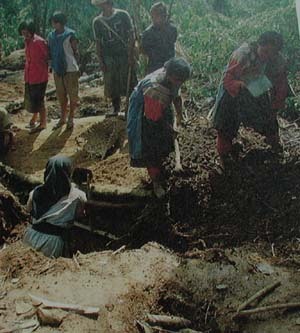 Little is known about these people - a few still live amongst the Thais near Chiang Mai - perhaps they bartered forest products, which were much in demand for the Chinese tribute trade, for ceramics of great beauty which they placed in a farewell gesture of reverence with the ashes of their dead.